THE TERM ‘Excursion’, according to the Concise Oxford Dictionary means ‘A journey or ramble with the intention of returning to the starting point. A pleasure trip of a number of persons, usually at reduced rates’. Those of us who remember the specials trains of the 1940s and 1950s may recall trips to seaside resorts, with the trains very often composed of non-corridor stock and hauled by an equally unprepossessing locomotive, or a reduced fare ‘day return’ ticket by ordinary service train. 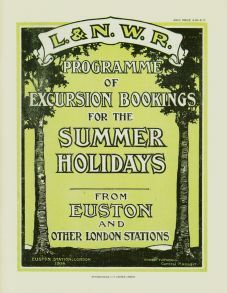 The LNWR, however, offered excursionists of the pre-World War One era a much grander programme. The index on page 3 gives a glimpse of what was available. The excursions were normally made by ordinary services with all its facilities. The choice of destinations from Euston was immense and included many towns and cities not on the LNWR network. They ranged from Aberdovey to Ayr and from Walsall to Wishaw. Many of the offerings were to destinations that would not be thought of, then or now, as tourist areas, but in the era before World War One, the pattern of travel before the motor car became universal was obviously very different. Family visits, especially for the middle classes, would be longer but less frequent than is now customary. The validity of tickets, especially for the more distant destinations, ranged from seven to sixteen days, and were available, not only at Euston but at a large number of LNWR town offices and agencies in the city, the prices being advertised with the times of departure and arrival, together with the return arrangements. Nothing was left unmentioned, a break of journey, excursions whilst away or diversions en route. There were some drawbacks to some of the excursions nevertheless. A journey to Crewe, for example, involved a departure time from Euston of 12.30am, giving an arrival at Crewe of 3.57am. Not the most welcome hour to drop in on your host! Any additional costs for a journey or holiday could be pre-arranged and paid for in advance. Steamer trips in Scotland, motor excursions in Shakespeare’s country, a half day trip to Harrow and Wealdstone or a holiday Contract Ticket in North Wales (plus bicycle) are all here, and much more. The LNWR proved what a magnificent organisation it was, being able to publish this information for the benefit of the travelling public in such a lucid format which is so far removed from today’s methods of not knowing which ticket is available on what train, or how much it will cost. The thoroughness with which it was compiled shows a professionalism with which the LNWR could be truly proud. While a lot of these 'season excursions' may have been by ordinary trains, some of the pages do seem to imply special trains (e.g. p12 - although apparently return by ordinary trains) it might be interesting to compare the specified trains with the corresponding Passenger Timetable to see which is which and reason for trains specified to be different on different days. Then there are some oddities e.g p28, half-day excursions to Birmingham etc. If going to Birmingham one has to get the 11.35 from Euston, which does not depart Willesden until 12.25 (and this an 'Express Excursion'), whereas if one goes to Coventry one can leave Euston at 12.15 and still depart Willesden 12.25 - why?? Also of interest are the places one could go by the ‘Excursions’. P23 includes places like Allerton, Batley and Brierfield - so how many people went to places like that for a holiday?